Teaching Tip Tuesday: Getting READY for the 100th Day of School! Yes, you are correct... there are 100 circles in the title picture of this blog post! I'm just trying to get prepared and excited for the 100th day of school. In Brenham ISD, that day falls on Wednesday, January 30th! Whatever you choose to do in your classroom, let's remember to celebrate this annual accomplishment. You've made it! 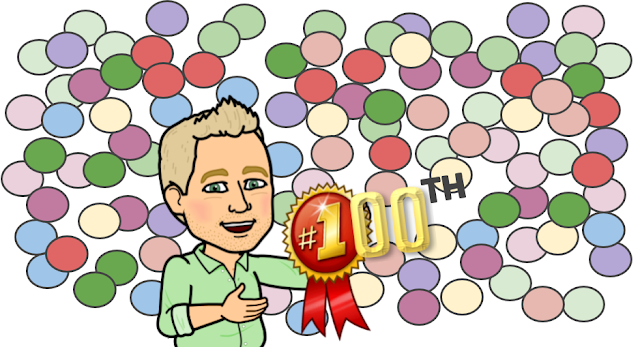 Your students have loved your lesson plans, completed your daily activities, hung onto every word of your oral readings, and have hopefully been present for all 100 days! In today's society, with drop-out rates, days missed, sick days, and everything else that keeps kids out of school... You and your students have been dominating with fantastic collaboration inside your classroom! So, pat yourself on the back and enjoy today's accomplishment!